I presented at the annual meeting of the „Ausschuss für evolutorische Öknonomik“ (committee for evolutionary economics) in Hohenheim, Germany. 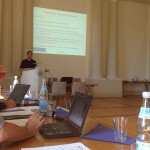 The presentation, entitled „The structure and evolution of R&D inter-sector resource complementarity in Germany from 1990 to 2011“, is based on a paper co-authored with Matthias Brachert. This entry was posted in Allgemein, Presentation and tagged collaboration, complementarity, presentation, R&D, resources. Bookmark the permalink.